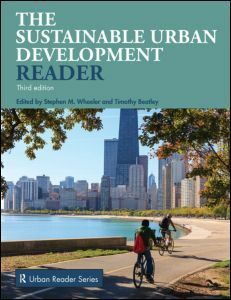 Building on the success of its second edition, the third edition of the Sustainable Urban Development Reader provide a generous selection of classic and contemporary readings giving a broad introduction to this topic. It begins by tracing the roots of the sustainable development concept in the nineteenth and twentieth centuries, before presenting readings on a number of dimensions of the sustainability concept. Topics covered include land use and urban design, transportation, ecological planning and restoration, energy and materials use, economic development, social and environmental justice, and green architecture and building. All sections have a concise editorial introduction that places the selection in context and suggests further reading. Additional sections cover tools for sustainable development, sustainable development internationally, visions of sustainable community and case studies from around the world. The book also includes educational exercises for individuals, university classes, or community groups, and an extensive list of recommended readings. The anthology remains unique in presenting a broad array of classic and contemporary readings in this field, each with a concise introduction placing it within the context of this evolving discourse. Revised content includes: Additional selections related to global warming, Additional selections related to food systems and public health. Updated and/or additional pieces related to developing nations. Updated material on green building and design standards, such as LEEDs. Updated and/or expanded material on equity and related social issues. Additional readings to cover: green jobs and the green collar economy, renewable energy, water resources, biodiversity, population, environmental politics, social equity and environmental justice, and local urban governance. Additional readings on sustainability pedagogy to introduce. Section 7 Updated and expanded case studies. Updated and expanded pedagogical exercises utilising YouTube, Google Earth and online GIS. Updated introductions to all pieces and suggestions for additional readings. The Sustainable Urban Development Reader presents an authoritative overview of the field using original sources in a highly readable format for university classes in urban studies, environmental studies, the social sciences, and related fields. It also makes a wide range of sustainable urban planning-related material available to the public in a clear and accessible way, forming an indispensable resource for anyone interested in the future of urban environments.